For my daughter's FIRST birthday I did a Ladybug Cake because we call her our little bug. It turned out so cute and I had a lot of fun trying to figure out how to accomplish my goal of a ladybug shape. Instead of baking in a pan, I used a pyrex bowl for the body and a smaller bowl for the head. Then I did a little trimming of each to get just the shape I wanted. I then used a dark and light pink icing for the body colors. The funnest part was finding the candy to use for the body decor. I used junior mints for the spots and eyes and I used rope licorice for the little mouth and antennae. I finished it off with some magical looking pink sugar "glitter". I also made matching flower cupcakes to go along side the ladybug. This was such a fun project and I was so happy how it turned out! VERY CUTE! IT TURNED OUT GREAT! Join in and write your own page! It's easy to do. How? 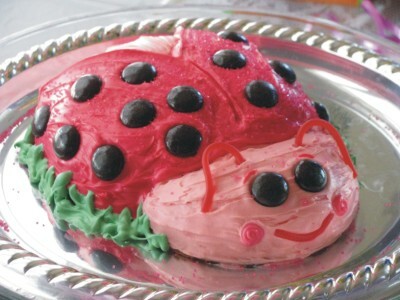 Simply click here to return to Ladybug Cake.